Heartwood » Blog Archive » Perfect? Nope. How do you know it’s sharp? The entire contents of the Heartwood blog, except for the theme elements provided by Wordpress, are copyright © Rob Porcaro. Legitimate blog aggregators are welcome to reproduce excerpts, including the opener photo, with the link. Online forums, fellow legitimate bloggers, and journalists are welcome to reproduce brief excerpts with clear attribution. Copyright infringement is stealing, it is wrong, and it is a crime. You’ve heard it in ads, seen it on magazine covers, and on TV. This square is dead accurate. The plane comes with a dead flat sole. Perfect edges in two minutes of sharpening. Stop it. Nothing is perfect. Not my work, not yours. The joinery in the photo is not perfect, trust me. Let’s eliminate sloppy, low quality work from this discussion. I’m referring to high quality work done by very skilled woodworkers, top quality tools, and so forth. As an example, consider the sole of your expensive new plane. Is it really perfect? Flat to within what, 0.002″? .001 “? Everywhere? 0.0005”? Doubt it. But what’s really important? A skilled woodworker knows that there should be, for example, no hollow just in front of the mouth. If there is light blocking contact there, as well as at the toe, heel, and just behind the mouth, it won’t matter if there is a bit of hollow in the middle of the front or rear sections of the sole. The wooden soles of Japanese planes are intentionally nuanced in this way. How about cutting the tails in making dovetails? Is the saw held perfectly square to the width of the board? Within what tolerance? A skilled sawyer attempts to directly split the layout line on the waste side, cutting at 90 degrees, but nevertheless knows on which side is the mountain and which the cliff. You are aware of a one-sided tolerance – if slight error is to occur, try to confine it to where it could be trimmed, or perhaps yield to the slight compressibility of wood, or at least won’t be noticeable in the finished work. The point is that a good craftsman gets beyond naive notions of absolute perfection of process or outcome and instead understands how to manage tolerances. He knows what is – and is not – critical to produce superb quality and apportions his energy accordingly. 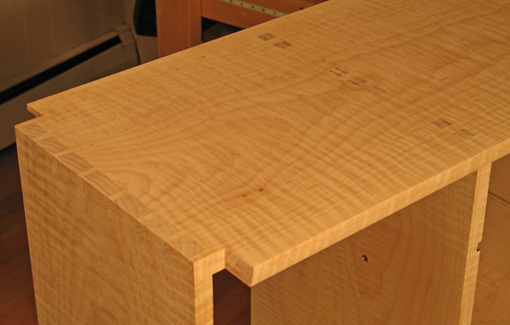 Likewise, a new woodworker should not be intimidated by the illusory goal of perfection. Nor should the novice be seduced by the claims of machine manufacturers that promise perfect joints or perfect anything. I hope for an educated, perceptive excellence in my work. Understanding is better than hype. Julie is here with me at work and she showed me your site! it looks really great! I am gald you finally got it up where people can see the lovely work you do! I also love your blog template. I am trying to put a blog together but the templates I found are too ugly! Where did you find yours? I am already on etsy but I need a blog as well. © 2019 - Heartwood is powered by WordPress.